The beefsteaks are back. Matt’s Market has them. 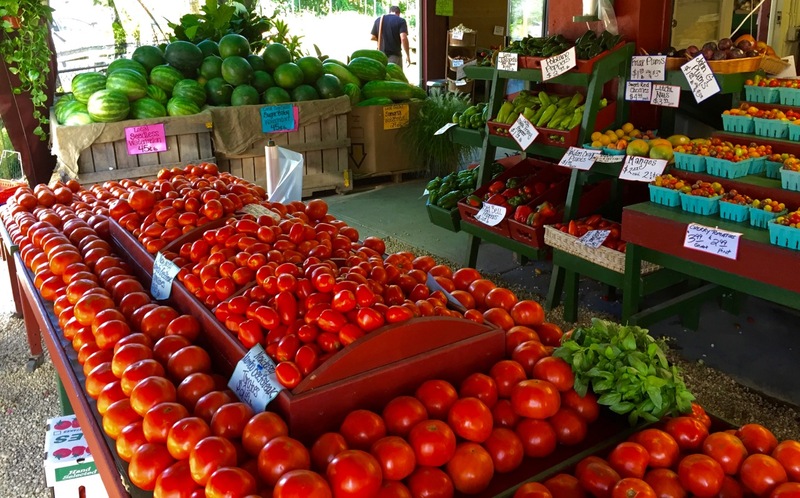 It’s a bit early for the local Jersey tomatoes to be at their peak. These at Matt’s, large and jumbo, are probably from South Jersey, but Matt has them, and Wegman’s does not. 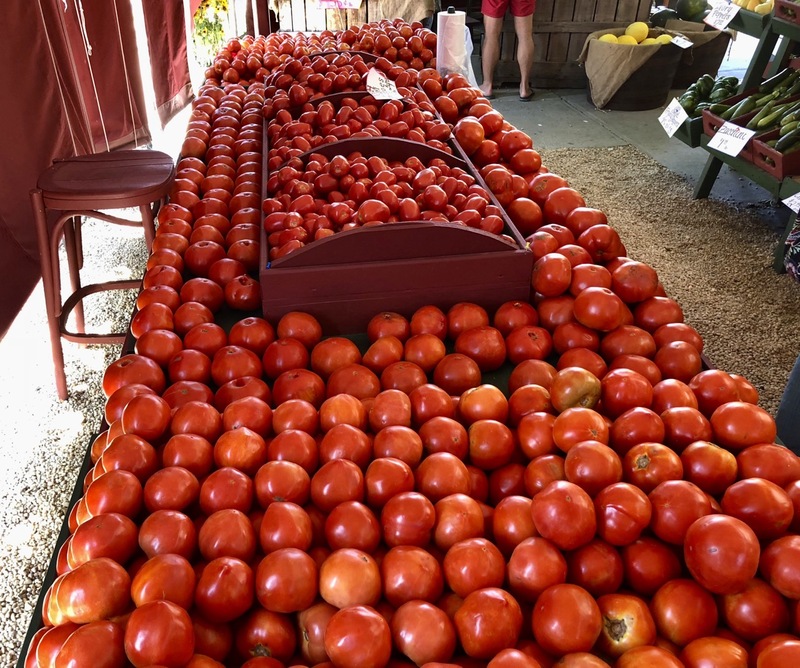 We wait every year in late August for this agricultural event, and if you search our website (search bar top right) just type in “tomatoes,”and you will see that we maintain an interest in this wonderful phenomenon. 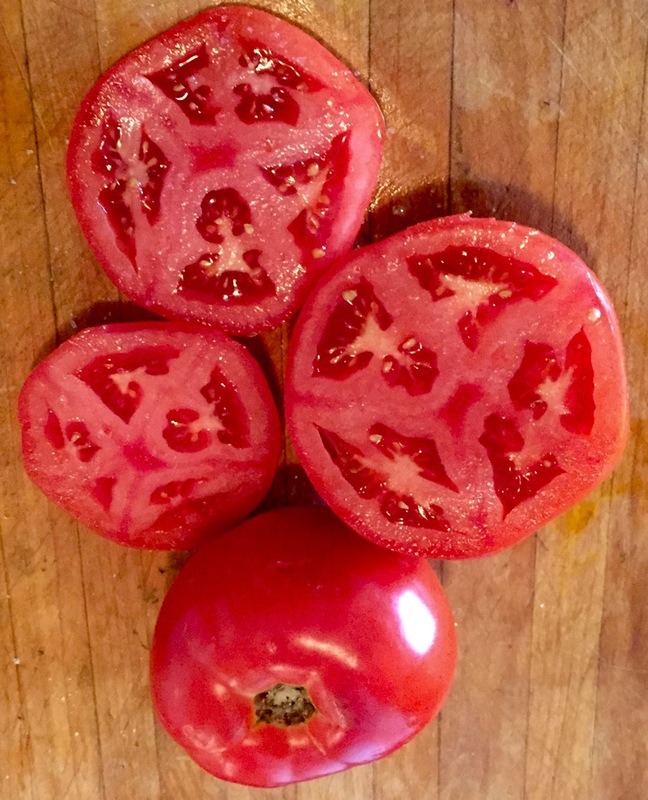 Just make your favorite sandwich (eg tuna or cheese) and put a slice of Jersey tomato on it and add a slice of Vidalia onion—make it on a Kaiser roll or some Jewish rye bread (Wegman’s has all those, and even including onion rolls.) A little Hellman’s mayo is the finishing touch. 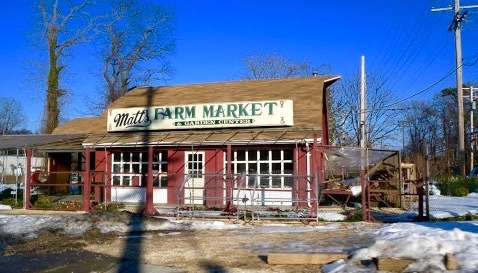 The best route to Matt’s is to take Memorial Drive into Belmar by the marina and turn left onto Rt. 71. Matt’s is a short distance on that road, on the left side. Parking is a bit tight, but there is a small strip mall next door where you can park. PERICO HERNANDEZ “Oye Como Va.” From the soundtrack of the movie Chef. Did the Italians invent the wheel? We met two gentlemen from Verona who seem to think so. By Eileen Goldfinger and Paul Goldfinger, Editors @Blogfinger.net. Photography by Eileen Goldfinger. 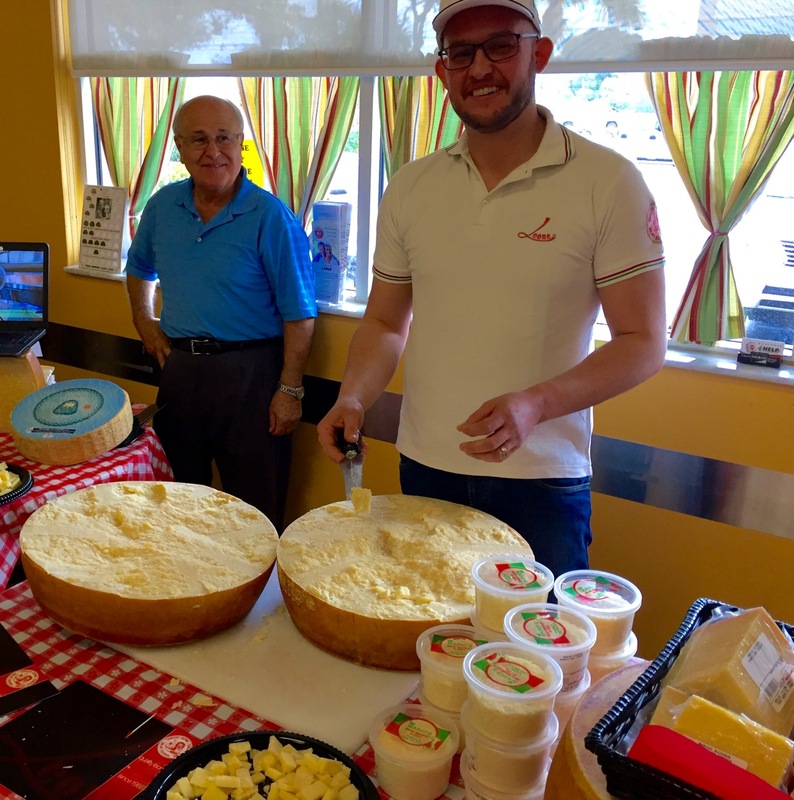 If you think that you can’t get authentic Italian cuisine in Florida, you haven’t visited Mario’s Meat Market and Deli in Fort Myers (southwest Fla). This remarkable food store has customers lining up at the counter where you can get incredible breads, meats, sauces, homemade sausage, cheeses, wines, desserts, and custom sandwiches. For example, one of their specialty heros is called “The Italian” and consists of salami, pepperoni, capicolo, provolone, lettuce, tomato, onion, hot peppers oil and vinegar on a superb role with sesame seeds. Some people can’t wait to get home, so they chow down at tables arranged outside. We were there picking up supplies for an Italian dinner that Eileen was planning and we stumbled on a “rare” culinary event. 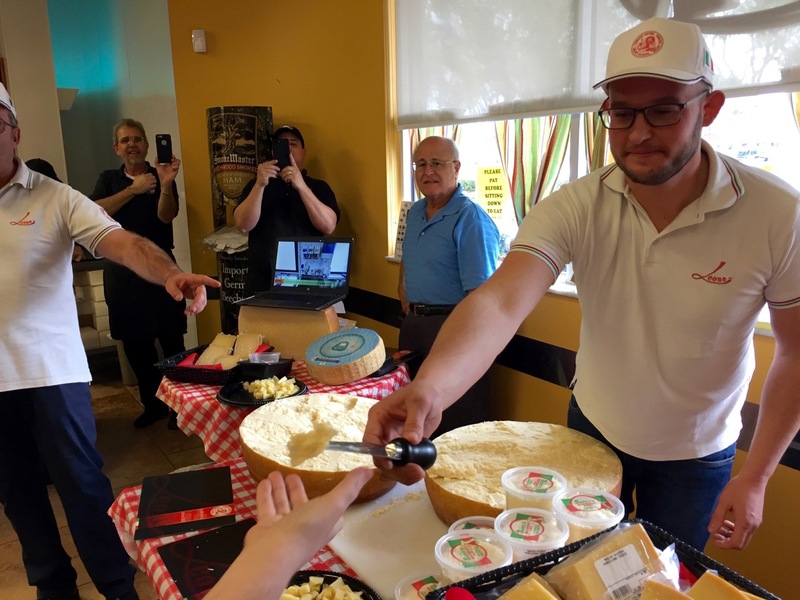 Representatives from a large cheese manufacturer (“Leone”) from the mountainous Verona region of Italy were getting ready to “open” one of their huge wheels. 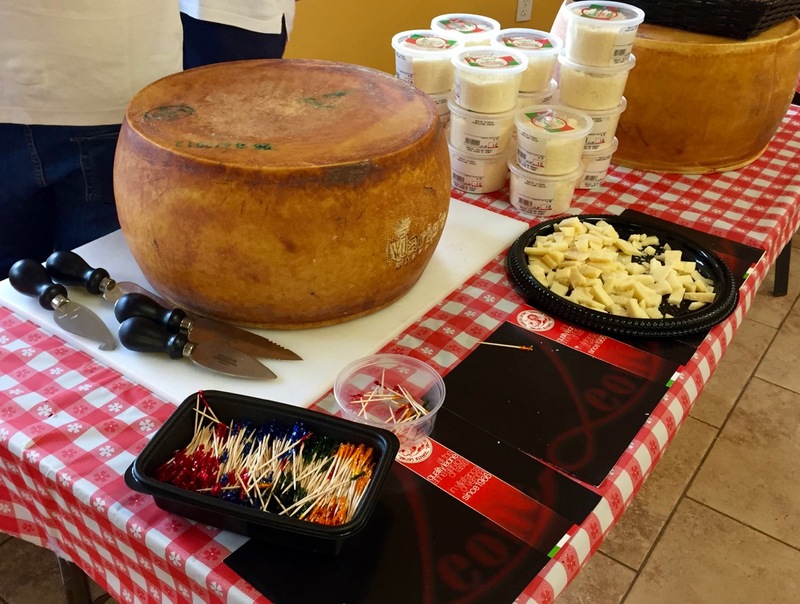 They were readying a parmigiano cheese called Monte Veronese, made from cow’s milk, specially prepared for Mario’s. What was unique about this wheel was that it had been aged for five years, much longer than most cheeses from that northeast region where much of the Italian cheese-making occurs. The storage facility is kept at 80% humidity and 61 degrees F.
No one knows how long wheels have been the motif for storing cheese, but this variety has been made for nearly 900 years. To open the wheel requires great skill and experience if it is done in the traditional way—- manually with knives. Usually they use machines. Gabriele Leone, the owner of the Leone company, brought out some special tools. He worked very carefully, but after watching this demonstration, I was amazed that he still has all his fingers. He was cheered on by the company’s bilingual American representative Mike Tuccillo and by Mario Pica, the owner of this remarkable store. When he finally opened the wheel, it was a very special event and the performance received a round of applause. 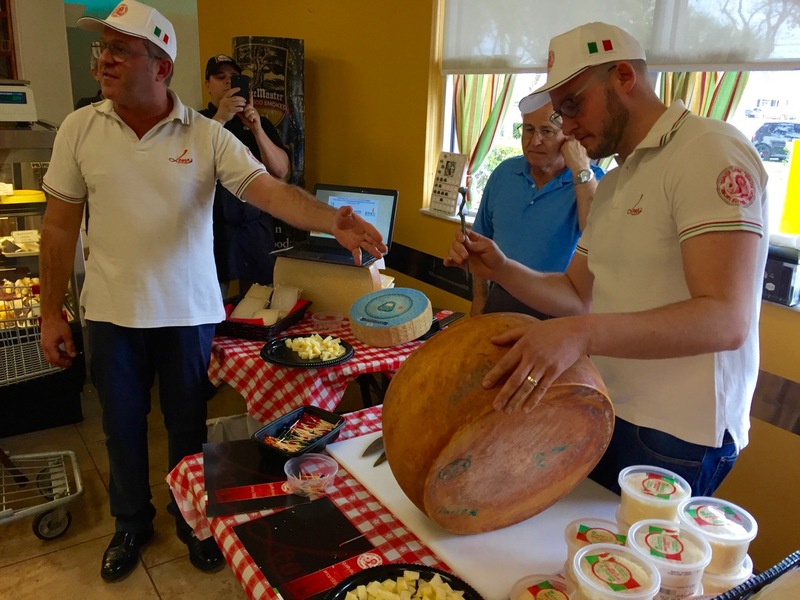 Then Gabriele began to offer chunks of the parmigiano, which is a hard cheese that tends to crumble. It is usually sold as wedges or grated. It should be stored in the refrigerator where it can last for up to 6 months. If a little mold begins to appear, just cut it off. We tried some, and it was delicious: fragrant and tasty. Mike explained that the company is beginning to export their unique aged products to America. Thanks to Mike, Gabriele and Mario for giving Blogfinger access to this very special event. Colored eggs straight from the chicken. Lovely to look at, but delightful to eat? Did you ever hear of colored eggs straight from the chicken? We found some at the Farmers’ Market in Fort Myers Florida. They were laid 24 hours before we purchased them. The egg man told us that the varied colors and sizes have to do with different breeds of chickens. 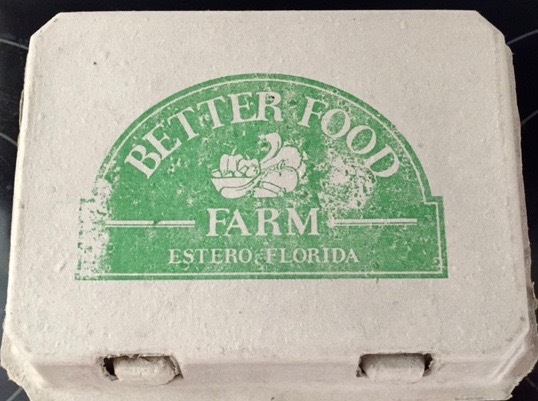 The chickens who laid the colored eggs are pasture-raised, to be distinguished from free-range. The latter can be held in small areas or even in cages, but pasture-raised chickens can roam around and eat all the bugs they like, and they are never caged. The farmer also gives the chickens surplus foods that he grows such as fruits and vegetables. He supplements their diet with flax seed (very good for omega 3’s) and he never gives them soy products. His chickens and eggs are organic. Thus the chickens eat only natural foods—nothing processed. If chicken feed is used, it must be certified organic, and the hens receive no antibiotics unless there is a rampant infection at the farm. As a result, he says that his eggs will be better tasting and more nutritious than run-of-the-mill store-bought eggs. Eggs have nutrients such as anti-oxidants and vitamins. The yolks have cholesterol, but there are no saturated fats. The egg industry has been trying for years to prove that we can eat all the eggs we want. An interesting fact is that eggs are naturally coated with a protectant that blocks the entry of bacteria inside the egg. Eggs that come from a chicken factory often enter the world in an unsanitary environment, so the eggs have to be washed. The farm eggs are not washed. Thus, this farmer’s eggs can be left out of the refrigerator for up to a month. According to him, eggs sold in stores may actually be months old and must always be refrigerated. An important variable is taste, so we did a taste test. Eileen made scrambled eggs (unseasoned) with store-bought “organic” eggs and with Market farm-bought organic eggs from the box above. Visually, the yolks on the farm eggs were a deep yellow-orange, whereas the store eggs were a paler color yellow. Both eggs had little flavor without salt. But after they were seasoned with salt and pepper and presented for breakfast, the farm eggs were more colorful, tastier, and creamier. 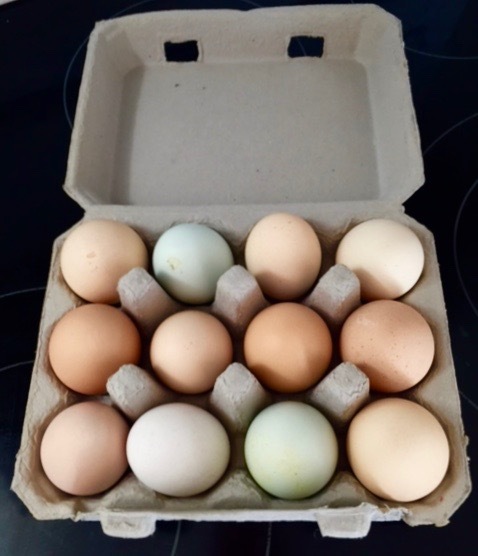 In Jersey we recently bought local farm raised “organic” eggs from Dino’s in Asbury Park on Main Street. They were very good, and their shells were brown. Dino’s eggs were $4.50 per dozen. The colored eggs were $7.00 per dozen.. Note: Here is a link to our article about cholesterol recommendations from one year ago on BF. Wegmans, 11 years old in Ocean Twp, embarks on a major remodeling project. A birds eye view of part of the Wegmans fresh food section. Paul Goldfinger photo while seated in the second floor café. © Click to make the portions bigger. By Eileen Goldfinger (food editor) and Paul Goldfinger (Editor) @ Blogfinger’s Wegmans office where much of the editing goes on daily. Wegmans is the go-to place for excellent food, both perishable and non. Many Ocean Grovers shop there. Each of their stores is tailor designed to match the location and clientele of each place. For example, with the large Jewish population in Manalapan, there is a huge Kosher section there, whereas in Ocean Twp, it is much smaller. The café, with table seating on two floors, is actually like a restaurant with many customers buying prepared meals, some as inexpensive as $8.00 and some as simple as a fresh sub. I would bet that Wegmans serves more lunches than any restaurant in the area. But the common denominator of all this is the company’s commitment to quality, variety, freshness and customer service. The values of the company originate at the Rochester, New York headquarters, but each store has a degree of autonomy as to how they function, and the employees are remarkably knowledgeable, happy and helpful. 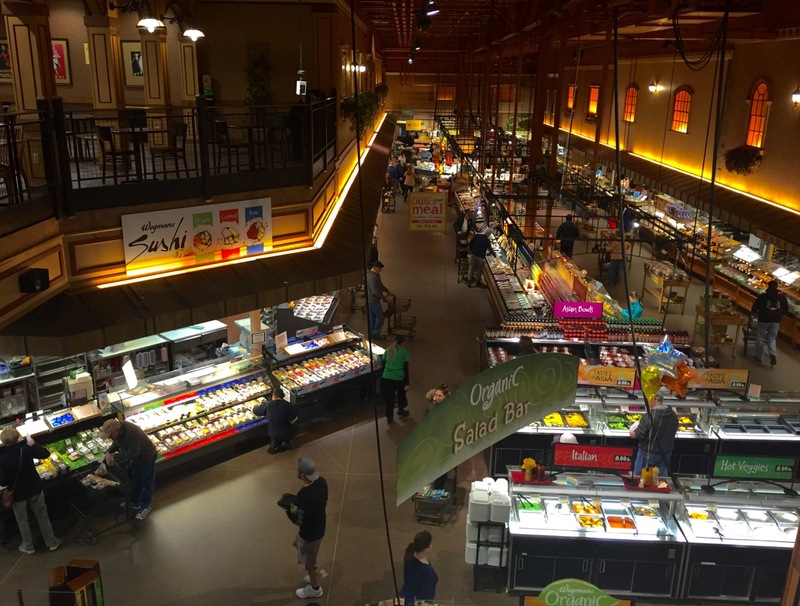 In recent years Wegmans Ocean has remodeled a number of sections including the produce department which is one of the best in the region. Their seafood, bakery, wine and prepared foods areas are incomparable and are delightful to visit. In fact most every department is superior. Tomorrow, January 18, they will embark on a remodeling of their non-perishable/grocery sections which begin north of produce and end at the personal health area by the pharmacy. The time frame for this project is Jan 18 to Feb. 12. The main goal is to improve the shopping experience for their customers. 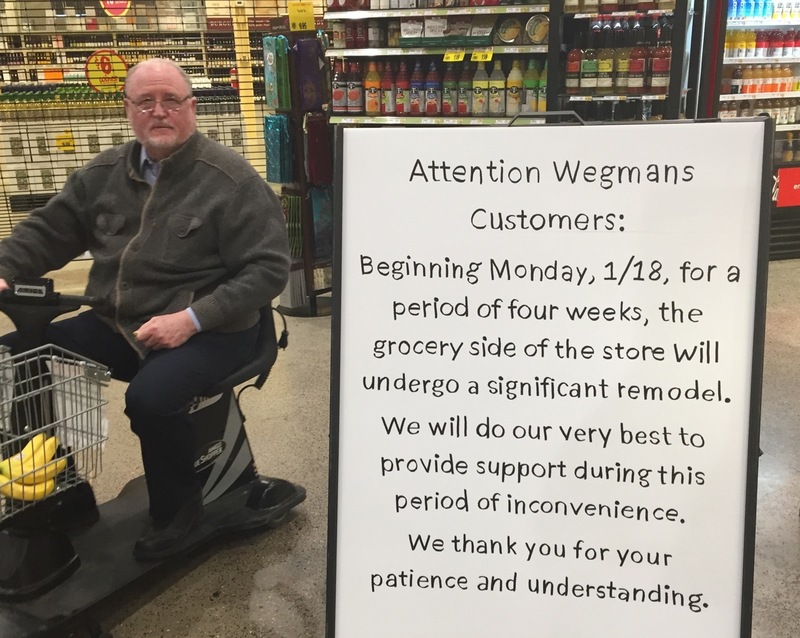 A Wegmans manager told Blogfinger that they will strive to complete this project without too much disruption from the perspective of shoppers. New, modern, adjustable shelving and displays will be featured. The end caps (at the ends of aisles) will be constructed to allow greater flexibility in featuring different items efficiently. The placement of products will be improved such as moving the greeting cards over to the flower market. Dairy and frozen foods will be unchanged. A new “may we help you team ” will be devoted to patrolling the aisles to assist customers. In addition, to offer assistance locating specific items, the familiar paper store maps will be updated daily to include specials and other information. We sat with Tony, an affable and knowledgeable store manager, as we discussed the project. We were sipping the excellent organic House Blend coffee from the Café while munching on fresh baked bagels with butter that is provided free. Our table was on the second floor, overlooking the spectacle of a typical Wegmans European-style food market where the colors, the hubbub, the people-watching and the sounds were all like viewing a floor show. Wegmans is entertainment and food. Tony was enthused about the new project, and, like so many Wegmans employees and managers, he takes great pride in the store. He was there when the Ocean store opened 11 years ago. He was a full time regular worker then, but over the years he rose to become a store manager. 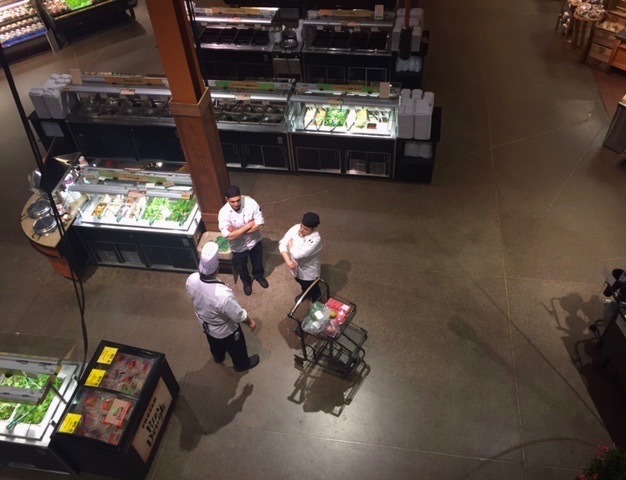 Among all the rest of its accomplishments, Wegmans is a place to forge a career, but you need to meet their high standards. The striped bass has been a major prize for Ocean Grove fishermen for generations. In the 1980’s, stripers became endangered, but they came back by 2007. In recent years, stores have not been allowed to sell them, although licensed fishermen are allowed to catch them, however there are strict rules governing size and numbers. Eileen caught a striped bass at Wegmans, but it was a farm -raised hybrid striper. (see photo above) . This week Wegmans is carrying these fish which are a cross between a striper and a white bass. 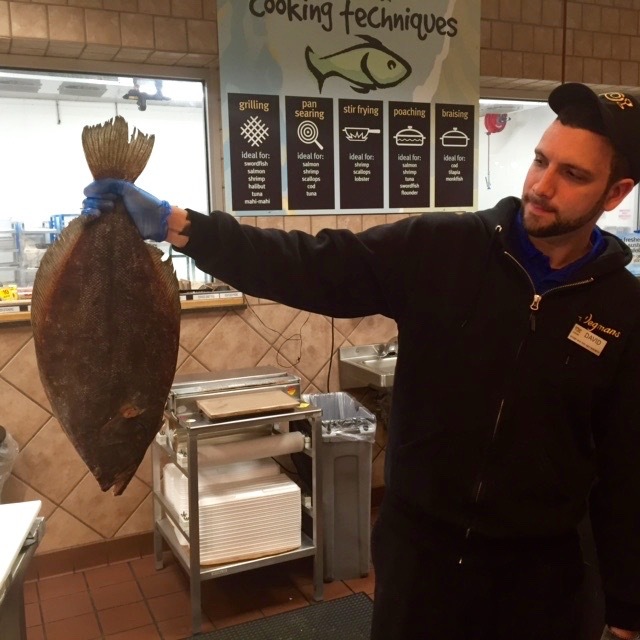 A Wegmans seaman filleted the fish which weighed 1.9 pounds. It yielded a one pound fillet with the skin. Eileen found the meat to be pinkish, but it was snow white when it was cooked, and it was delicious, coming off the skin easily with a butter knife. Here is an action video filmed live by our movie crew in Eileen’s kitchen, and below that are her instructions for sautéing a hybrid striped bass.Turn on the music below during the video. Heat a mixture of 2 tablespoons extra-virgin olive oil and 2 tablespoons of margarine in a 12 inch nonstick fry pan until the margarine melts and the mixture is sizzling. Rub paprika and freshly ground black pepper on the fillets. (Approximately 1 pound). Sauté the fillets skin side up for 10 minutes on medium low heat. Dice 3 scallions & 1/4 bell pepper, and add them to the pan after the 10 minutes . Then you are ready to flip the fish over and cook on the skin side. Raise the heat to medium and continue cooking for another 10 minutes. During the last five minutes of cooking use a spoon to baste the fish with the oil/margarine mixture bubbling in the pan. 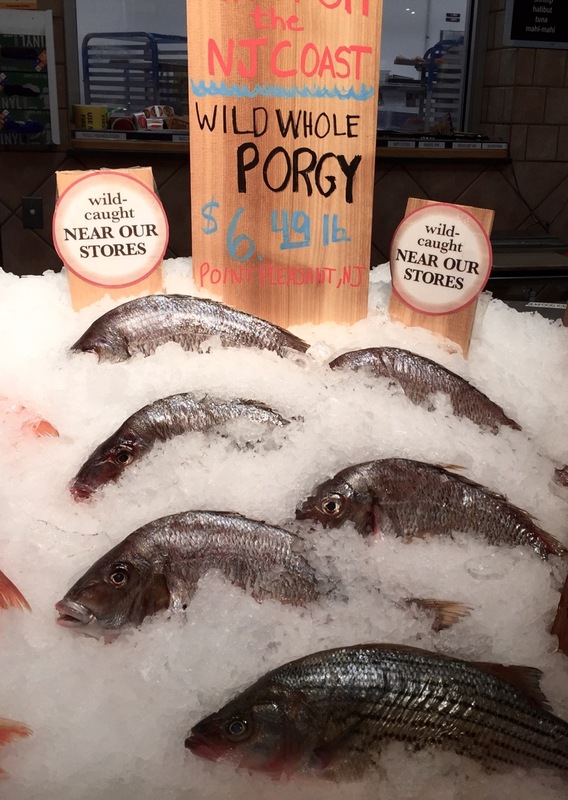 The connection with Wegmans porgy catch is that the story of Porgy and Bess, an opera by George and Ira Gershwin, is set in an African-American neighborhood in Charleston called Catfish Row. Today is the 11th anniversary of the Wegmans Ocean store, so they’re serving ice cream sundaes on Sunday in the employee break room. And yesterday was the grand opening of their wine store’s new look—it is now twice its former size, although at the expense of some parking in the back. We will do a separate review of that amazing shop. Yesterday they were having a tasting of an Italian Valpolicella which is a light red from northern Italy, a place where wine growing goes back to the Greeks. We got to compare that $63.00 wine with a $14.00 version from the same area. I guess I need some work on my wine appreciation, because I liked the cheaper version better. But my studies in oenology consist of watching “Sideways” about half a dozen times. Wegmans seafood department is extraordinary; better than some we have visited where the boats come in at Florida’s southwest coast region. Everything is presented with immaculate care and freshness. They carry a nice variety of whole fresh-caught wild fish including, today, sea bass, red snapper and fluke, to name a few. We are having company, so I chose the largest fluke there. Let’s call her Florence. She was a very beautiful 4 pounder, and it took Dave about 15 minutes to filet the fish down to 2.5 pounds. Flukes have very thick skin which some cooks find difficult to work around, so I asked Dave to skin it. After that we were down to 1.9 pounds of actual fish. So if you select a whole fish, don’t forget that the filet will be about half the weight, although the mavens at Wegmans can make a good guess as to how much the filet will weigh. Of course you pay for the fish before Dave carves it up. We will photograph Eileen’s finished product and post her recipe tomorrow.